Go to original pattern for design DROPS 202-38. 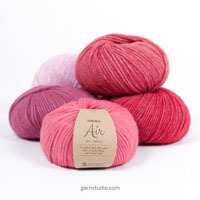 Knitted shawl in DROPS Fabel. The piece is worked back and forth with garter stitch and rows of holes. Measurements: Height in middle approx. 30 cm = 11 3/4”. Length along top approx. 172 cm = 67 1/2”. 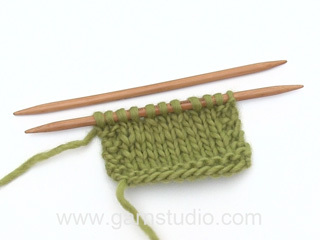 21 stitches in width and 40 rows in height with garter stitch = 10 x 10 cm = 4” x 4”. 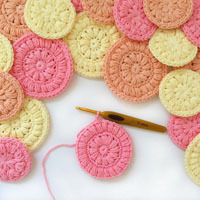 DROPS CIRCULAR NEEDLE SIZE 4 MM = US 6: length 80 cm = 32”. The piece is worked back and forth with circular needle so that there is room for all the stitches. 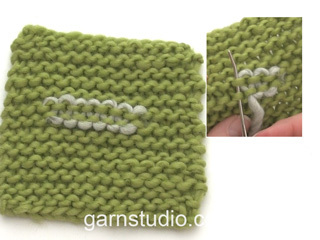 The whole piece is worked in GARTER STITCH – see description above. Cast on 9 stitches with circular needle size 4 mm = US 6 and Fabel. Knit 1 row. ROW 1 (= right side): Knit 2 stitches in first stitch (i.e. 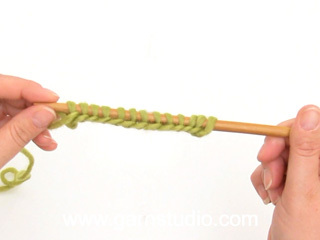 knit in both front and back loops of the same stitch), 1 yarn over and knit to end of row (= 2 stitches increased). 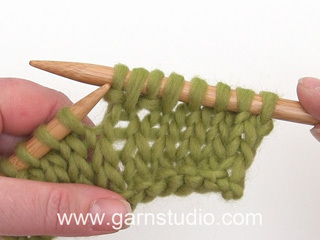 ROW 2 (= wrong side): Knit 2 stitches in first stitch, 1 yarn over and knit to end of row (= 2 stitches increased). Work ROWS 1-2 a total of 5 times (= 20 stitches increased) = 29 stitches on needle. ROW 3 (= right side): Knit 2 stitches in first stitch, 1 yarn over, knit 1, * 1 yarn over, knit 2 together, 1 yarn over, knit 1 *, work from *-* a total of 8 times and knit 3 (= 10 stitches increased) = 39 stitches on needle. ROW 4 (= wrong side): Knit 2 stitches in first stitch, 1 yarn over and knit to end of row (= 2 stitches increased) = 41 stitches on needle. Work ROWS 1-2 a total of 10 times (= 40 stitches increased) = 81 stitches on needle. ROW 5 (= right side): Knit 2 stitches in first stitch, 1 yarn over, knit 2, * 1 yarn over, knit 2 together, 1 yarn over, knit 1 *, work from *-* a total of 25 times and knit 3 (= 27 stitches increased), 108 stitches on needle. ROW 6 (= wrong side): Knit 2 stitches in first stitch, 1 yarn over and knit to end of row (= 2 stitches increased) = 110 stitches on needle. Work ROWS 1-2 a total of 15 times (= 60 stitches increased) = 170 stitches on needle. ROW 7 (= right side): Knit 2 stitches in first stitch, 1 yarn over, knit 1, * 1 yarn over, knit 2 together, 1 yarn over, knit 1 *, work from *-* a total of 55 times and knit 3 (= 57 stitches increased), 227 stitches on needle. ROW 8 (= wrong side): Knit 2 stitches in first stitch, 1 yarn over and knit to end of row (= 2 stitches increased) = 229 stitches on needle. Work ROWS 1-2 a total of 10 times (= 40 stitches increased) = 269 stitches on needle. ROW 9 (= right side): Knit 2 stitches in first stitch, 1 yarn over, knit 2, * knit 2 together, 1 yarn over , knit 2 together, 1 yarn over, knit 1, 1 yarn over, knit 2 together, 1 yarn over, knit 2 together, 1 yarn over, knit 1, 1 yarn over, knit 2 together, 1 yarn over *, work from *-* a total of 22 times and knit 2 (= 46 stitches increased), 315 stitches on needle. ROW 10 (= wrong side): Knit 2 stitches in first stitch, 1 yarn over and knit to end of row (= 2 stitches increased) = 317 stitches on needle. Work ROWS 1-2 a total of 15 times (= 60 stitches increased) = 377 stitches on needle. Binding off should be loose so that the edge is elastic. Bind off with knit and make 1 yarn over (which is bind off as normal) as follows: * Knit and bind off 4 stitches, make 1 yarn over and cast it off as a normal stitch *, work from *-* until all stitches have been bind off. Cut and fasten strands. Ik heb 2 hele mooie bolletjes garen waar ik dit patroon graag mee wil maken. Alleen die twee bolletjes hebben totaal maar ongeveer 300 meter. 2 bolletjes Fabel garen is goed voor ongeveer 400 meter. Kan ik dit patroon wel maken, of moet ik toch op zoek naar ander garen? Het totaal aantal meters (/yards) is inderdaad de beste manier om te controleren of je genoeg garen hebt. Dat zou dan inderdaad helaas te weinig zijn. Smukt sjal. Jeg har købt det flotte garn, men nu mangler jeg også opskriften. Hei AB. dette skal vi få rettet snarest, takk for beskjed og god fornøyelse. Hvor er selve opskriften til denne nye opskrift 202-38? Hei Iluna. dette skal vi få rettet snarest, takk for beskjed og god fornøyelse. Adoro. Estou ansiosa pela receita.